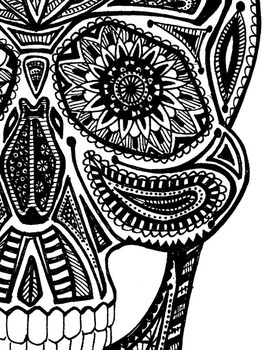 This clip art is hand drawn using pen and ink. 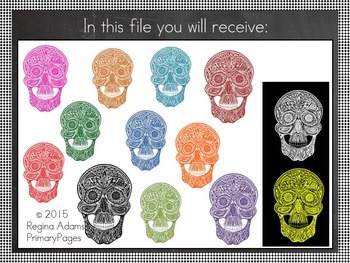 The skull collection includes 13 colors, all of which can be seen in the preview. The images are png format 300dpi. They are great for any age group! Perfect Halloween, Day of the Dead, Science class...!! If you have any requests for me, such as another animal or object, please contact me and I will do the best I can to accommodate you! The clip art may only be used to create products for your classroom, products to be sold on Teachers Pay Teachers, or personal crafting. Credit must be given with a link to my Teachers Pay Teachers store. Clip art can not be shared in digital or print form, no exceptions. 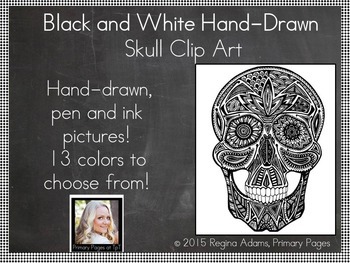 Clip art may be used as coloring pages in your classroom only. You may not sell them as coloring pages. No alterations of the clip art are allowed, other than resizing or creating a mirror image. Clip art can not be resold as is. It must be a decorative part of an original product. If you have a question about the TOU, please feel free to contact me via my store, Primary Pages, on Teachers Pay Teachers.